I am very thankful to Karl Carter for sending me this CMOG web page published today August 1 2014. The interaction between Mr. Ustad Nasrullah of Herat Afghanistan and Bill Gudenrath of CMOG is palpable. You may recall that March 9 2013 I wrote about the 28-minute YouTube video “The Glassmakers Of Heart” on this email list. The Corning Museum of Glass (CMOG) recently hosted a very special guest, Ustad Nasrullah, a glassmaker from Herat, Afghanistan. He, along with Kabul Galleria of Art owner Rameen Javid, visited the Museum as part of a U.S. tour, funded in part by a grant through the International Folk Art Alliance in Santa Fe, NM. The visit was an exciting opportunity for the exchange of glassmaking knowledge, and took us back to the very roots of the art form. 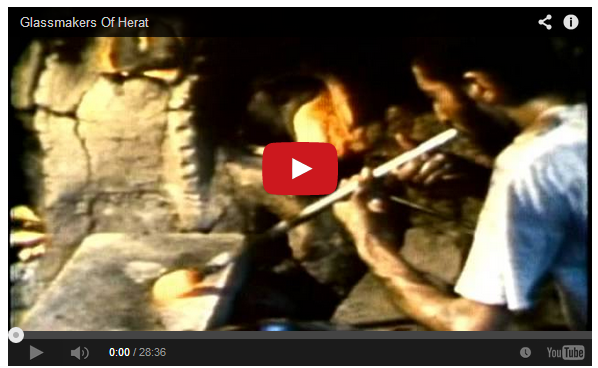 As the film footage shot in 1977 shows, Mr. Nasrullah sits on the ground right at the mouth of the furnace when he works. He uses raw materials collected from the riverbed and desert. His tools are handmade and less than a meter in length, the blowpipe fashioned from the barrel of a gun. During his trip, his first outside of Afghanistan, Mr. Nasrullah had a chance to work with Bill Gudenrath, the resident advisor of The Studio, and together they blended their knowledge and technique to create glass. “Everything must have felt utterly foreign to him,” Gudenrath said, whose work station at The Studio is set up in a contemporary Venetian style. Gudenrath made several pieces, even incorporating Mr. Nasrullah’s raw materials to add color. Although Gudenrath encouraged Mr. Nasrullah to “have a go at it,” he was hesitant at first to do more than watch. Mr. Nasrullah later met with Dr. Brill, whom he remembered seeing as a child during the documentary filming. They watched the film together, reminisced about the experience, and discussed the state of glassmaking in Herat today. Since his last visit to Herat in 1993, Dr. Brill had tried many times to contact the family, but had been unsuccessful, so he and many other Museum staff members were excited to learn the rest of the story. It is the hope that Mr. Nasrullah will be able to incorporate some of what he learned in the U.S. at his home kiln in Herat.